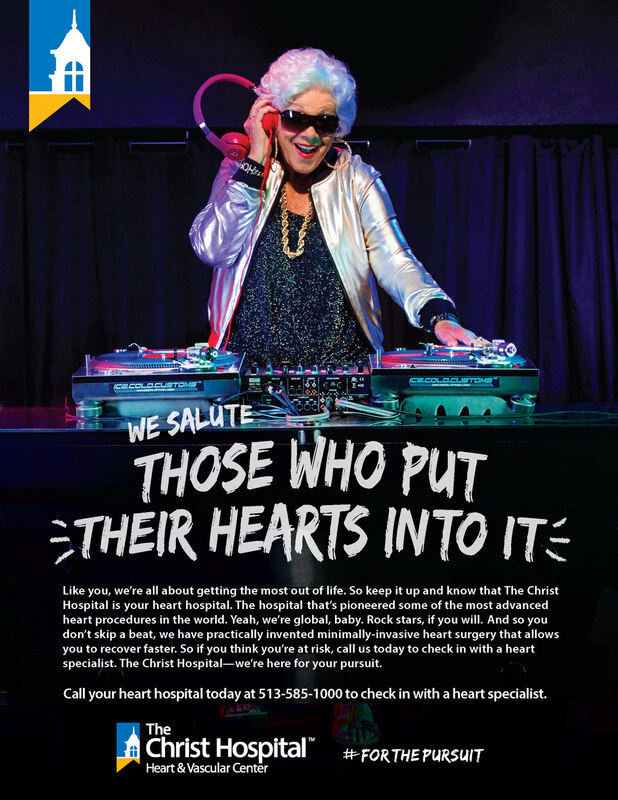 As part of a highly competitive regional healthcare market, The Christ Hospital Health Network challenged us to create a breakthrough creative campaign that would stand out and connect with consumers. The "For Your Pursuit" campaign focuses on the emotional side of healthcare, celebrating diverse lifestyles and expressing that The Christ Hospital truly gets you and will keep you doing what you love. Let’s celebrate life. All of it. Life that's spontaneous and true, lived by unpredictable people tenaciously in love with being alive. From crazy to calm and silly to sentimental, you embrace life and live it healthcare confident. Because you have the best partner, a top network that understands and keeps up with real life, and is with you every step of the way. So rather than fret, you just live for the pursuit. To kick off the campaign, we created a video that conveys the essence of the pursuit concept. The campaign came to life in unique messages across core service lines—heart, joint/spine, oncology, women's services and primary care. Click each piece to expand. One huge milestone for the organization in 2015 was the opening of a new full-service Joint & Spine Center, an impressive addition to the hospital that set a new standard for care in the region. We created a TV spot to celebrate and promote this achievement.